By anyone’s standards, even the lofty ones of The Gandhi Foundation, Amritsar is a holy city. As well as the Golden Temple, there are dozens of gurdwaras, mosques, and mandirs, as many as there are pubs in an English city. But for me, one of the holiest places in the world is another building in Amritsar, one you will not have heard of. Just a short ginrickshaw ride from the Golden Temple, past Jallianwala Bagh, opposite the bus stand in a dusty bazaar selling tyres, bananas, and cocacola (as all bazaars in India do), is Pingalwara, literally House of Cripples. As the name implies, the residents of Pingalwara are Amritsar’s destitute – orphans, the elderly, homeless, physically and mentally disabled – and as the name also implies, they are neither shy nor embarrassed about what they do there. Pingalwara is an astonishing achievement. They house over 1200 residents in six cities. They run hospital services, dentistry, homes for those who need them, prosthetics centres, dispensaries, rehabilitation units, schools, a printing press, an animal sanctuary and a tree nursery, all through charitable contributions. But Pingalwara is all the more astonishing when you know the story of how it came about. As good Gandhians, you will know that at the start of the twentieth century, India was still run by white men in shorts and pith helmets, who shot tigers and drank gin in the heat. Kipling was writing stirring tales of bravery on the North West frontier, and India had no thought of independence beyond a rumour of some lawyer disturbing the peace in South Africa. Into the Punjab, in 1904, was born Ramji Das, to a widow who was befriended by Ramji’s father, a wealthy businessman who kept the boy at a distance for fear of disturbing the inheritance arrangements. Ramji was sent to boarding school first in Khanna and later in Lahore. In his spare time he served in the Hindu temples, cleared litter and stones from the street, and was kind to animals; unusual, for one of his years. Eventually the family finances dried up and the boy ended up homeless, a hundred miles from his family. Sadly, even the mandirs where he served refused him help. Fortunately the Punjab is predominantly Sikh, and with the help of some local farmers he found his way to a Sikh temple. Everyone who comes to a Gurdwara, anyone at all, is welcomed, fed, offered shelter and the opportunity to hear from the Guru Granth Sahib. I shall never forget my first visit to a Gurdwara. It was a haven from the New Delhi taxi drivers who have replaced the “jungle, tigers, cobras, cholera, and sepoys” that beset the European travelers of Kipling’s time and who, trust me, are far more frightening. And the kindness of the Sikhs was overwhelming. The penniless, starving, and homeless boy of our story records that he too was conquered by their kindness. He converted to Sikhism, and changed his name to Puran Singh. Christians and Sikhs both believe that we get to heaven only by God’s Grace, not by our own efforts. But the more astute of us will have noticed how opportunities to show our appreciation often make themselves apparent. So it was that Puran Singh passed by a little boy at the entrance to Gurdwara Dehra Sahib, abandoned, and clearly mentally and physically disabled. To be an orphan in India is bad enough, even today. To be so profoundly disabled is practically a death sentence. So Puran Singh did what had to be done. He picked up the boy, cleaned away the excrement from his body and clothes, fed him, and gave him a name – Piara, which means “beloved”. 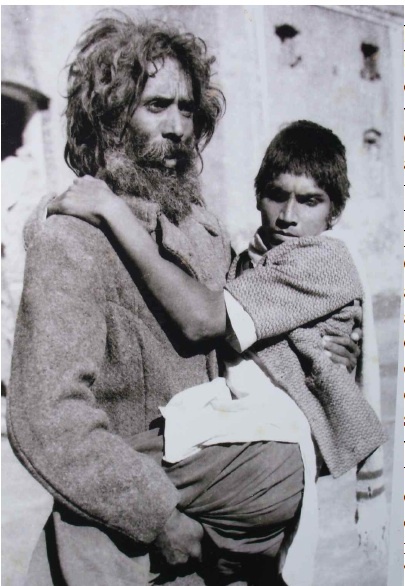 Now Piara had no family, Puran Singh had no wheelchair and so took to carrying Piara who clung to Puran “like a garland around my neck”, he said. Piara had found a family, and Puran had found a way of serving God. For the next thirty years, Puran Singh worked full time in all sorts of charitable causes, until partition intervened. When hell finally broke loose on 13 August 1947, Puran Singh was out working, and had left Piara at the Gurdwara. By the time Puran Singh heard the riots and returned, rioters had surrounded the place, and Piara was alone and vulnerable in the middle of it. Somehow Piara was rescued and the pair managed to escape Lahore, and on the 18th August the pair reached the Indian side of the Punjab, where matters were not much better. Partition displaced millions, the Punjab was rent open and Amritsar, its beating heart, was exposed to all the human sufferings it is possible to see. The well-appointed gardens of Khalsa College were turned over to the twenty-five thousand refugees flooding in along the Grand Trunk Road day by humid August day. No human being runs a Sikh temple. God does. To be more precise, the spirit of the Sikh gurus resides in the holy book, the Guru Granth Sahib, which is read aloud to provide guidance to those who would listen. Now, the practicalities of this arrangement are simple: it is down to everyone to get on and cook, clean, read and serve, so that no-one who visits guruji ever goes away hungry, thirsty, tired, or unloved. By this fine example are all Sikhs taught, and Puran Singh learned the lesson well. So with only the clothes he stood up in, he set about caring for the refugees at Khalsa College. Months and years went by, and eventually the shanty towns disappeared. Only Puran Singh and his ragged collection of destitutes remained. By this time he was dressed as a tramp, hair unkempt and unturbaned, begging from door to door for the money to feed his family, living and dressing beneath the lowest dalit on the dirtiest city street in India. The arches at Amritsar railway station became home for a while, and the move to this better accommodation was accompanied by increasing donations. Eventually a plot of land became free and with a donation from the Golden Temple Committee, Pingalwara was finally completed on 6th March 1957. As a young man, Puran Singh discovered Gandhiji, took to wearing khaddar and read all he could about Bapu. Puran shared Bapu’s ideas about village life and sustainability and took a keen interest in the environment. Perhaps because Pingalwara is so close to a heavily polluted part of Amritsar, or because he saw so many people die of respiratory problems, in his later years he often berated dignitaries who turned up to Pingalwara in motorised transport. As far back as 1928, he was aware of the dangers of flooding caused by deforestation, and he had passing connections with Mirabehn and Sarlabehn (Katherine Heilemann, another of Gandhi’s European followers). Sunder Lal Bahuguna – one of the founders of the Chipko movement and another Gandhian – is a patron of Pingalwara. Like Bapu, when Puran Singh died his possessions amounted to just a pile of clothes, a pair of spectacles, and the few tools needed in his daily routine. After Puran Singh died in 1992 Bibi Inderjit Kaur, a physician and disciple of Bhagatji, took over the running of Pingalwara, a post she still holds today. Pingalwara is open to visitors. In fact they are welcomed. Puran Singh’s original campus on the Grand Trunk Road is still a peaceful oasis amid the noise and squalor of India’s first road. Most visitors to Amritsar only want to see the Golden Temple and the Wagah border closing ceremony before they move on to Dharamsala. But the Punjab is full of modest little gems, and Pingalwara is among the best of them. Don’t forget to plant trees. They are a sign of the prosperity of a nation! The Pingalwara website is www.pingalwaraonline.org, where you can find details of how to visit, volunteer or donate to them. UBSPD, 2001, ISBN 978-8174763372, contains many good pictures. Books, 2004 is a more detailed biography. Chris Clarke is active in the interfaith movement in Newcastle. Brought up an Anglican he now serves at the local gurdwara and Hindu temple. I am Msc.BEd teacher. I want to join thetrust. I want to serve your trust. Please give me a chance to live in your family.